Aesthetic Distance is David Cotterrell’s third solo exhibition with Danielle Arnaud. 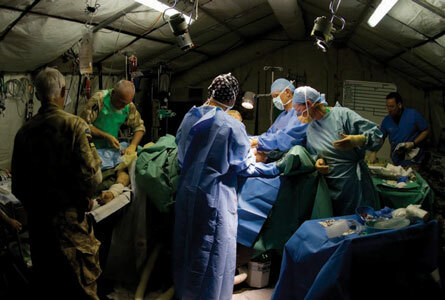 After two years of negotiations between the Wellcome Trust, Imperial War Museum and Ministry of Defence, David Cotterrell was invited to observe the Joint Forces Medical Group at Camp Bastion in Helmand Province, Afghanistan. He underwent basic training, was taught the rudiments of battlefield first aid and was issued with body armour. In November 2007, he flew in an RAF C17 from Brize Norton to Kandahar, the sole passenger in a plane loaded with half a million rounds of palletised munitions and medical supplies to join Operation Herrick 7. Focusing on these experiences and their inevitable aftermath, Cotterrell has produced a new body of photographic and video work. 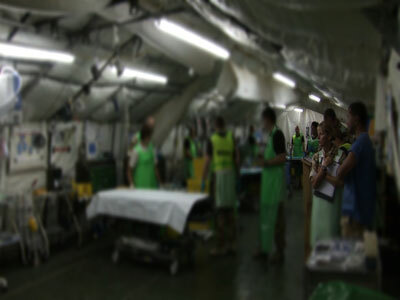 Two films explore the transport and treatment of casualties during a Major Incident. 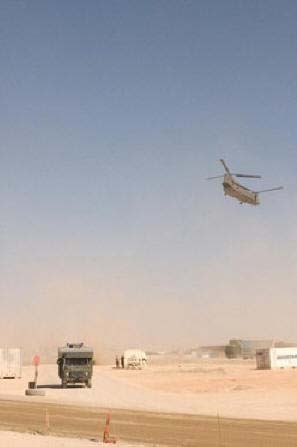 In Serial Loop the sound of a continuously arriving and departing Chinook helicopter accompanies images of a bleak and wasted landscape. A fire rages in the distance while antiquated ambulances lumber along to take wounded to treatment areas. Green Room gives an alternative vision of the same event. 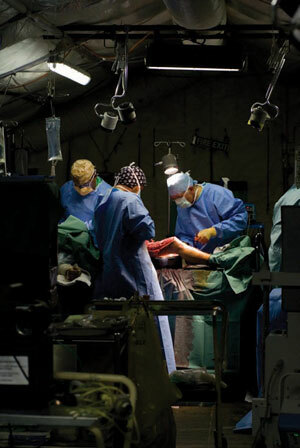 Medics wait for their assigned patients, their bodies and faces concentrated on the tasks to come over the next four hours, like actors preparing to go on stage. A series of photographic works, Sightlines, Principals and Supernumerary are arranged as diptychs and triptychs. 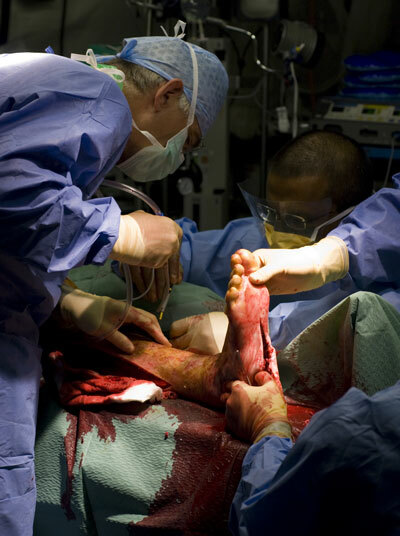 Shot in the Operating Theatre, these images reference painters famous for their use of chiaroscuro. The lighting and formal arrangements caught in the artist’s lens for a moment distract the viewer’s gaze, suggesting the sublime beauty within horror, the human scale compassion in the face of destruction. A further series of images, Gateway, documents the handing over of casualties as they pass from Camp Bastion to Selly Oak, Birmingham. 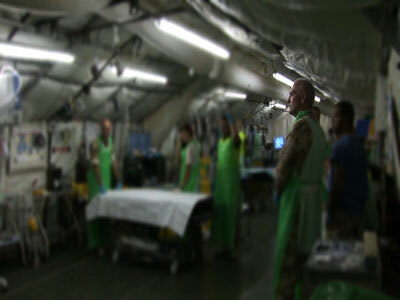 Transferred from one plane to another in the middle of the night on Kandahar’s airstrip, the wounded are sedated and virtually unaware of their journeys. 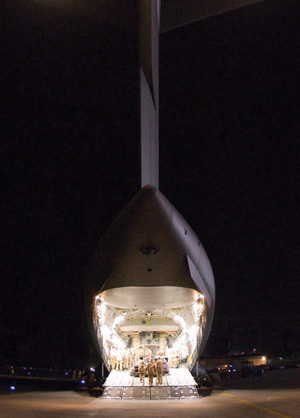 The grandiose scale of the planes belies the absolute fragility of their human cargo, soldiers who may take years to recover from wounds sustained in the fraction of a second. Cotterrell’s work for the exhibition reflects on a brief period of time in Helmand Province, in which two British soldiers died, 29 were wounded in action, 74 were admitted to the field hospital, 71 Aeromed evacuations were recorded and an undisclosed number of civilian, insurgent and Afghan National Army soldiers were treated. David Cotterrell received an MA in Fine Art from Chelsea College of Art & Design in 1997. He is an installation artist working across varied forms including video, audio, interactive media, artificial intelligence, device control and hybrid technology. His work exhibits political, social and behavioural analyses of the environments and contexts that he inhabits. Cotterrell is Professor of Fine Art at Sheffield Hallam University. Over the last ten years, his work has been extensively commissioned and exhibited in North America, Europe and the Far East for gallery spaces, museums and the public realm. Recent exhibitions include: Eastern Standard: Western Artists in China at MASS MoCA North Adams, Massachusetts; Map Games at the Today Museum of Modern Art, Bejing and Birmingham City Art Gallery; War and Medicine, Wellcome Collection, London. He is currently researching and developing new work with advanced simulation company SEOS, with the support of an Arts Council England bursary. This material was developed by David Cotterrell during a period of research commissioned by the Wellcome Trust. Cotterrell's work was enabled by the Ministry of Defence, who facilitated his stay at Camp Bastion in November 2007, and was further supported by the RSA, who invited him to stay in Kabul for a month in early 2008 in order to view an alternative aspect of Afghanistan.